This past summer Shir Bodner, ’12, launched a documentary-film project on Soviet Jewish immigration to Richmond. Today the project has blossomed to involve a host of University of Richmond students, faculty, and staff. Gregg Davidson, a 1982 UR graduate and Jewish Family Services (JFS) board member, said the project grew out of a November 2011 brainstorming session between members of JFS, a Richmond-based nonprofit health-and-human-services agency; UR Hillel, the University’s Jewish student organization; and Andrew Goodman, director of Jewish Life and campus rabbi at UR. 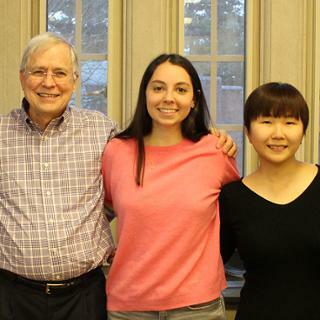 During that meeting, Goodman and UR students learned about the role JFS played in resettling 800 Soviet Jews in Richmond during the late 1980s and 1990s. Davidson and Goodman needed a student to spearhead the documentary film project. Enter Bodner. Bodner was pursuing a major in international studies with a Middle East concentration, served on the board of UR Hillel, and taught Hebrew at UR’s Global Studio. Most importantly, the project resonated with Bodner on a personal level. She experienced emigration firsthand during her childhood when her family moved from Boston to Israel and then back to Boston four years later. Three generations of her family emigrated from the former Soviet Union (FSU) to the United States and Israel. 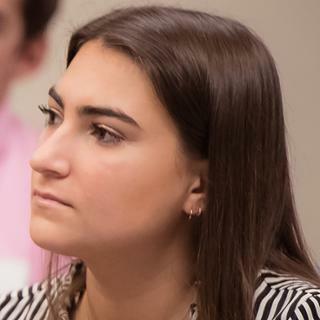 The Bonner Center for Civic Engagement awarded Bodner a competitive Burhans Civic Fellowship to launch the first phase of the project under Davidson’s supervision during a 2012 summer internship with JFS. Dr. David Brandenberger, associated professor of history and international studies and an expert on the FSU, served as Bodner’s faculty mentor during the fellowship. Bodner researched the political and social themes behind Jewish emigration from the FSU, the U.S. immigration process, and Jewish immigrants’ adaptation to life in Richmond. She helped develop interview questions for FSU Jews who immigrated to Richmond in the 1980s and 1990s with the assistance of JFS. These 800 immigrants represent a fraction of the approximately 200,000 FSU Jews who immigrated to the United States during this time period. “Gorbachev’s glasnost policy created a more open society, giving many people the ability to emigrate for the first time,” Bodner explained. “The Soviet Union was not the utopian society it had promised to be. “The people I interviewed are proud to be American,” Bodner said. “They are living the American dream. They have the opportunity to choose what they want to do with their lives. Before, for example, they might have worked at one factory for their whole life because there was no mobility in Soviet society. Bodner’s research and interviews spurred her to delve into her family’s story of emigration from the Eastern Block and the FSU to the United States and Israel. Bodner parlayed her summer fellowship into an independent geography study and an international studies thesis. Since her graduation in December 2012, she has continued her involvement with the JFS film project by managing the logistics of scheduling and archiving interviews. Perhaps most exciting is the extent to which the campus community has embraced the project. Many other UR students are now working on the documentary. Goodman convened a 20-member faculty advisory group. The University Museums staff will curate an exhibit on the resettlement of Soviet Jewish émigrés in Richmond to coincide with the planned debut of the film in spring 2014. 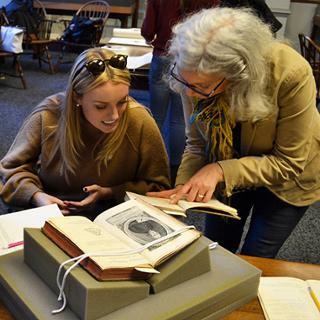 Several community-based learning classes from a range of disciplines, including modern literatures and cultures, American studies, and film studies, will contribute to the documentary. The Digital Scholarship Lab is lending its expertise to the project as well. 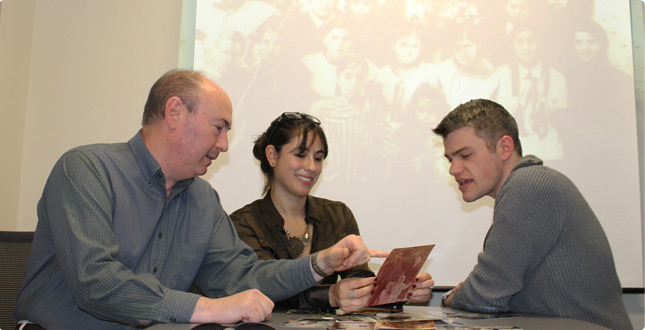 Photo, left to right: Gregg Davidson, Shir Bodner, and Rabbi Andrew Goodman review historical photographs for the documentary-film project.